Since leaving the U.S., we passed through The Netherlands, Hungary, Slovakia, Austria, Germany, and now the Czech Republic. 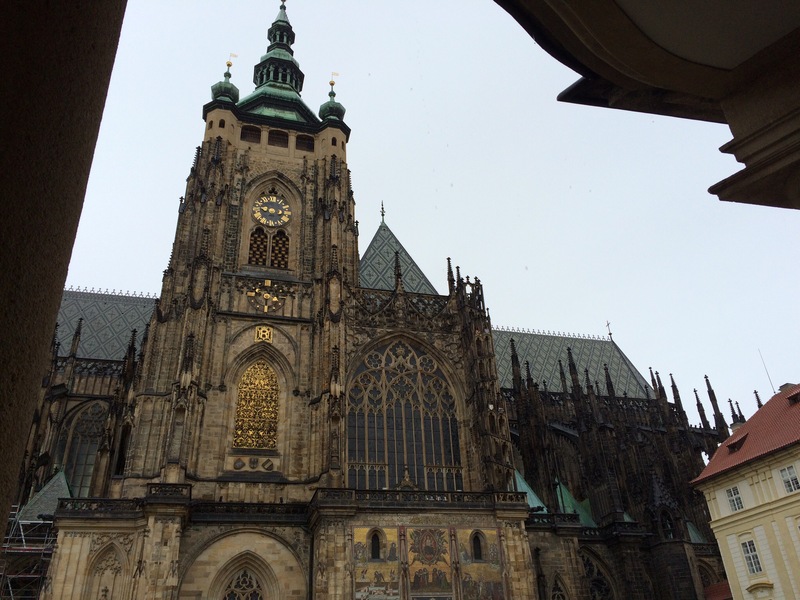 We arrived in Prague yesterday late.Today we toured in the rain for a good part of the day. We have done walking tours in far worse weather (Edinburgh comes to mind!) and were generally relieved to leave the oppressive heat. The rain may have slowed down the visitors to Prague but certainly did not keep them in. By the time we came down from Prague Castle to the Charles Bridge, there was heavy foot traffic. The by the time we came to the square in Old Town where the Astronomical Clock is, you could not move easily. Of course umbrellas don’t help. I love the architecture of this place. From our hotel we look up the street to the area adjacent the Powder Tower, the entrance to the oldest part of town. It is a spectacular mix of architecture dating back several hundred years. Today we visited Prague Castle, saw outside of the home of the President, visited St Vitus Cathedral, saw where the first Emperor lived (very plain palace), walked across the Charles Bridge, walked through the lower town and Old Town and through the square where you find the Astronomical Clock. Fascinating. I also had a for real European cappuccino and loved it. Our guide was a 40 year old Czech native who told stories of the communist takeover from the perspective of her Mom and grandmother. Said she had the same sort of “learn Russian or else” early schooling but also stated that her Czech peers have nothing for the Russians who remained in this country or have since 1989 immigrated looking for a better life and especially those who have refused to learn the language or Czech customs and accommodate themselves to living in the culture. Very serious about that position. Her English was very good but she self-admitted she spoke in “Czechlish” and we thought that was funny. She was describing stained glass window depicting Christ being crucified and described it as “Christ being crossed” which resulted in some momentary head scratching. She also told about a school Maria Theresa established here for young girls to,learn how to become “Madams” – someone asked questions about that and she explained they learned manners, etc. She meant “ladies” and some of our British traveling partners explained to her that was using a term that might describe a lady of the evening. She was horrified. I suppose we all learned something today! We saw gold bricks in the wall depicting the water levels from floods over the years in the lower town. The worse was in 2002. The highest markers I saw were higher than my head. Apparently the flood filled the underground and was terribly devastating. I can see that easily. We have (unfortunately) found here (as well as on the entire adventure) the breads, desserts, and ice cream very much to our liking. That will be a rude awakening for us when we get home. The hotel restaurant is very good. The serve a brown bread baked in a clay pot. That is how they bring it to the table – still in the pot. Oh my. Marmalades and jams are quite good too. We tried dumplings on the ship but did not care for them. We do like lamb, the breakfast sausages, and here particularly how they grill chicken. Not sure what they put on it but it is good. Still trying to decide what we will do tomorrow on our last day. I will let you know when we do.